We’ve all been there — seven odd paint chips in hand, the colors all ever so slightly different in shade, holding them up to a wall or a project and trying to discern the “perfect” color. You operate under the fear of going through all the work of painting your item of choice just to discover the color isn’t what you expected, or worse, completely off from what you envisioned. 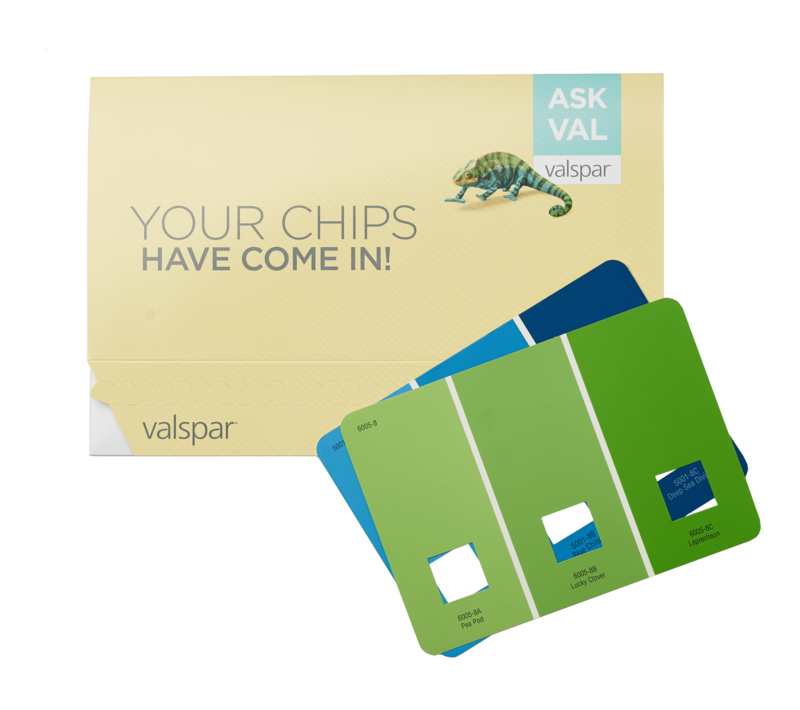 Well, Valspar has developed a brand-new interactive tool to help take the pressure off for DIYers both fresh and seasoned. AskVal.com is an innovative interactive web-based tool offering an extensive collection of complementary tools to guide the color decision process including the first-of-its-kind Valspar Pinterest Analyzer, free expert design advice, photo color matching, color personality quiz and free paint chip delivery. AskVal.com was designed to help people make confident color decisions through a suite of personalized color tools and content. By taking color exploration cues from high-style industries such as fashion and cosmetics, the mobile-first site shortens the amount of time you’ll spend on selecting colors for your paint projects, matching colors across their brands at Lowe’s, Ace Hardware, and independent retailers. One of the most creative aspects of the site is its built-in integration with Pinterest’s API. The key feature of the platform is its ability to help pinpoint the right color for your project. Not only can the site’s photo matching application translate any image into Valspar paint colors, but Valspar’s Pinterest Analyzer feature, built using the Pinterest API, turns a user’s Pins into palettes by pulling out a user’s highest-trending colors for quick and easy inspiration. So all of those home decor and DIY images you’ve been filing away on your Pinterest Boards now are the basis for the perfect color palette by analyzing what you’ve already been pinning for this very purpose. Another great feature is the Paint Chip Delivery — once your colors are analyzed and matches provided via AskVal.com, you can add the free swatches to your cart to be shipped to your home, saving you a trip to one (or several) stores. And with Valspar’s paint guarantee, once you pick a color and paint your project, if it’s still not right, they’ll reimburse you for a second color (methods vary based on retailer, check valspar.com for details). We think using AskVal to explore paint color options looks like it could be an indispensable tool in our virtual tool belts. Valspar’s new site stands to help a lot of DIYers pick the perfect color for their projects the first time around, hopefully with a lot less worry and stress.